Nothing Else Matters is a super song to learn on the guitar, it has a great acoustic melody and a really nice general mood to it, even if you are not a Metallica fan. This is a mega lesson with a lot of material to cover, so beginner guitarists might find it a bit challenging. I suggest splitting it into several parts, and learning it piece by piece one day at a time. The Nothing Else Matters video guitar lesson will take you through the entire song in parts, so it’s really important to have your downloaded tabs in front of you when you practice it afterwards. You’ll start off with the intro to the song, which is still fairly simple, as it involves an E minor arpeggios, with some lead guitar techniques incorporated into it. You’ll learn aboutnatural harmonics towards the middle of the lesson, which will add a nice gentle touch to your playing not just this song, but also later on as well, when you start making up your own stuff. Then you’ll learn the many chords you’ll need to play the verse and chorus, including the chord progressions and finger picking pattern. Afterwards, you’ll learn the prechorus and the final section of the song. It is a very long lesson, so have your sheet music ready. 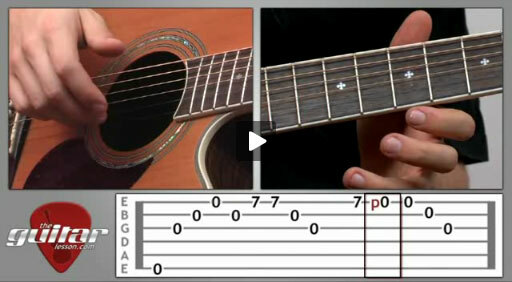 In summary, learning this song will give you a great chance to practice finger picking and chords, which in turn, will really improve the coordination of your fretting and picking hands. Beginner guitarists might find this song more challenging than other songs on the website, as it is fairly long and requires a lot of technique and coordination. If so, have a go at anothereasy guitar song, and come back to this one later on, there's no rush. Nothing Else Matters was released by Metallica in 1991 on their self-titled album, also known as the Black Album. An interesting fact is that when James Hetfield started composing the song, he was on the phone with his girlfriend and only had one free hand, hence the E minor arpeggio in the intro, which uses all open strings. This is one of the few Metallica songs in which James Hetfield plays the guitar solo, rather than Kirk Hammett. Sorry, but you've reached a premium content area. The download of the Nothing Else Matters tablature file is only available to premium members. Sorry, the same goes for the backing track. To download the backing track to Nothing Else Matters, please log in and revisit this page.